Merging sophistication with style and elegance, the platform bed from the Astrid Collection by Homelegance blends in effortlessly with modern décor with its trendy design and contemporary appeal. Crafted using solid hardwoods and wood veneers in a warm espresso finish, this impressive yet minimalist platform bed is available in Queen, King and California King Sizes. 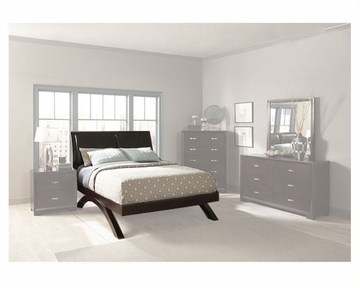 The impressive design flaunts a bi-cast vinyl insert in the headboard while the arched legs enhance the design aesthetics for a unique, chic look. Available in queen, King and california king sizes.